Fairy Tales - Transforms hair to soft, silky perfection. Fairy tales super charge detangling Shampoo, 12 Fluid Ounce Detangling and smoothing solutions for unruly knots & curly tops. Calms, eliminates frizz and moisturizes with Panthenol and Vitamin E. No parabens, soy, sulfates, phthalates, gluten, or nuts. Helps comb thru with ease to eliminate struggle with comb and brush. Keratin and vitamin b extracts strengthen, smooth and detangle all hair types, and is great for the whole family. Fairy Tales FAIRY-DETCOND12 - Keratin and vitamin b extracts strengthen, smooth and detangle all hair types, and is great for the whole family. Lightly mist the hair then gently brush through. No parabens, soy, gluten, sulfates, phthalates, or nuts. Keratin protein and provitamins B and E improve manageability and help prevent breakage. Keratin protein and pro-vitamins B and E improve manageability and help prevent breakage. This nourishing conditioner is super-charged with natural jojoba and aloe vera extracts to soften, smooth and detangle unruly locks. Helps comb thru with ease to eliminate struggle with comb and brush. 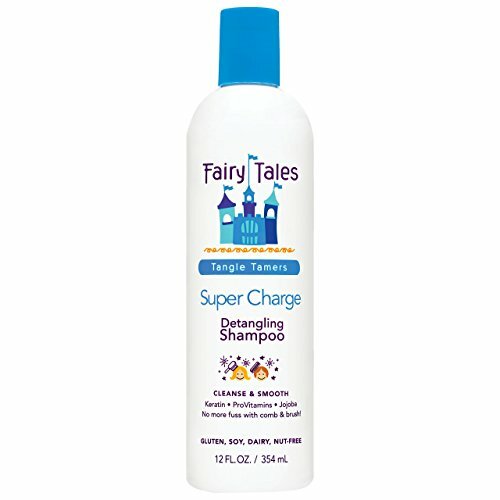 Calms, eliminates frizz and moisturizes with Panthenol and Vitamin E.
12 oz - Fairy Tales Tangle Tamer Super Charge Detangling Conditioner for Kids - Transforms hair to soft, silky perfection. Detangling and smoothing solutions for unruly knots & curly tops. Can be used on wet or dry hair. Fairy Tales FAIRY-LEMAIDCOND8 - Lightly mist the hair then gently brush through. Keratin and vitamin b extracts strengthen, smooth and detangle all hair types, and is great for the whole family. Loaded with natural extracts and rich, creamy moisturizers to deep clean and condition even the most sun damaged hair. Leave-in 3-5 minutes for extra conditioning. Gluten, sulfates, soy, dairy and nut free. Detangling and smoothing solutions for unruly knots & curly tops. Lemon-aid conditioner by fairy tales for kids - 8 ounces conditioner. Free of parabens, harsh chemicals and toxins. Great for swimmers and beach goers of all ages. Remove sea salt, chlorine green and daily build-up with gentle fruit extracts. 8 oz - Fairy Tales Sun & Swim Lemon-Aid Conditioner for Kids - Helps comb thru with ease to eliminate struggle with comb and brush. Calms, eliminates frizz and moisturizes with Panthenol and Vitamin E. Aloe, jojoba, vitamins e and b restore moisturize and shine for tangle free hair. Can be used on wet or dry hair. Transforms hair to soft, silky perfection. Vitamins and minerals restore softness, boost shine and protect hair. - Gluten, paraben, dairy and nut-free. Rich conditioner instantly replenishes moisture to dry, britle sun damaged hair. Mururmuru butter moisturizes for lasting hydration, frizz control and defining curls while avocado butter provides softness and shine. Free of parabens, harsh chemicals and toxins. Lightly mist the hair then gently brush through. Vitamins and minerals restore softness, boost shine and protect hair. Gluten, soy, sulfates, dairy and nut free. Fairy tales curly-q hydrating conditioner provides necessary moisture to curls to keep them shiny and looking fabulous but is lightweight enough not to weigh them down. . No parabens, soy, gluten, sulfates, phthalates, or nuts. Fairy Tales Curly-Q Hydrating Conditioner - 8 oz - Sulfate & Paraben Free - Keratin protein and provitamins B and E improve manageability and help prevent breakage. Great for swimmers and beach goers of all ages. Remove sea salt, chlorine green and daily build-up with gentle fruit extracts. Detangling and smoothing solutions for unruly knots & curly tops. Transforms hair to soft, silky perfection. Calms, eliminates frizz and moisturizes with Panthenol and Vitamin E.
Fairy Tales K-HC-1022 - Enriched with vitamins and minerals, condition, our formula helps to cleanse, detangle and prevent head lice. Detangling and smoothing solutions for unruly knots & curly tops. Calms, eliminates frizz and moisturizes with Panthenol and Vitamin E. Gluten, soy, dairy and nut free. Proprietary blend of organic Rosemary, Lavender, Peppermint, Citronella, Tea Tree and Geranium oils helps prevent lice. Jojoba, aloe and Chamomile hydrate, moisturize and soothe the scalp. Free of parabens, sulfates, harsh chemicals and toxins. Vitamins and minerals restore softness, boost shine and protect hair. Rich conditioner instantly replenishes moisture to dry, britle sun damaged hair. Gluten, paraben, dairy and nut-free. 8 oz - Fairy Tales Rosemary Repel Daily Kid Conditioning Spray for Lice Prevention - It is clinically proven effective to help prevent lice, and is gentle enough for everyday care for children and adults alike. Mururmuru butter moisturizes for lasting hydration, frizz control and defining curls while avocado butter provides softness and shine. Keratin and vitamin b extracts strengthen, smooth and detangle all hair types, and is great for the whole family. Gently cleanses while Aloe nourishes and hydrates curly and wavy hair. Leave-in 3-5 minutes for extra conditioning. Aloe, jojoba, vitamins e and b restore moisturize and shine for tangle free hair. Fairy Tales - Sulfate, soy, phthalate-free. Gently cleanses while Aloe nourishes and hydrates curly and wavy hair. Mururmuru butter moisturizes for lasting hydration, frizz control and defining curls while avocado butter provides softness and shine. Leave-in 3-5 minutes for extra conditioning. Lightly mist the hair then gently brush through. It is infused with fruit extracts to define curls, control frizz and keep hair shiny and full of bounce and control and keep curls in place all day long. Gently cleanses while Aloe nourishes and hydrates curly and wavy hair. Mururmuru butter moisturizes for lasting hydration, frizz control and defining curls. 12oz - Sulfate & Paraben Free - Fairy Tales Curly-Q Daily Kid Hydrating Shampoo - Natural quinoa and rice amino acids helps define curls and improve manageability. Calms, eliminates frizz and moisturizes with Panthenol and Vitamin E. Loaded with natural extracts and rich, creamy moisturizers to deep clean and condition even the most sun damaged hair. Gluten, paraben, dairy and nut-free. Vitamins and minerals restore softness, boost shine and protect hair. Free of parabens, harsh chemicals and toxins. Helps comb thru with ease to eliminate struggle with comb and brush. Natural quinoa and rice amino acids helps define curls and improve manageability. Fairy Tales Hair Care - Calms, eliminates frizz and moisturizes with Panthenol and Vitamin E. Enriched with vitamins and minerals, our formula helps to cleanse, condition, detangle and prevent head lice. Fairy tales curly-q shampoo lightweight formula is designed to hydrate thirsty locks, help detangle unruly knots and define curls and tame frizz.
. Leave-in 3-5 minutes for extra conditioning. Gently cleanses while Aloe nourishes and hydrates curly and wavy hair. This ultra-fine, ultra-dry mist can be layered, styled and reworked to perfection. Detangling and smoothing solutions for unruly knots & curly tops. Vitamins and minerals restore softness, boost shine and protect hair. Fairy Tales Hair Care Curly-q Styling Spray Gel - Free of parabens, harsh chemicals and toxins. Gluten, paraben, dairy and nut-free. It is clinically proven effective to help prevent lice, and is gentle enough for everyday care for children and adults alike. This super lightweight spray gel works to control frizz while shaping and holding curls all day long. Helps comb thru with ease to eliminate struggle with comb and brush. Gluten, paraben, dairy and nut-free. Create great shine and seal out humidity. Fairy Tales - Tangle Tamers Super Charge Nourish & Smooth Detangling Conditioner for Kids - 12 fl. oz. Fairy Tales Hair Care - Fairy tales - tangle tamers super Charge Nourish & Smooth Detangling Conditioner for Kids - 12 fl. Can be used on wet or dry hair. Sulfate, soy, phthalate-free. Transforms hair to soft, silky perfection. Lightly mist the hair then gently brush through. Keratin protein and provitamins B & E improve manageability and help prev Detangling and smoothing solutions for unruly knots & curly tops. Gluten, paraben, dairy and nut-free. It is clinically proven effective to help prevent lice, and is gentle enough for everyday care for children and adults alike. Free of parabens, harsh chemicals and toxins. Mururmuru butter moisturizes for lasting hydration, frizz control and defining curls while avocado butter provides softness and shine. Fairy Tales - Tangle Tamers Super Charge Nourish & Smooth Detangling Conditioner for Kids - 12 fl. oz. - Loaded with natural extracts and rich, creamy moisturizers to deep clean and condition even the most sun damaged hair. Helps comb thru with ease to eliminate struggle with comb and brush. Natural quinoa and rice amino acids helps define curls and improve manageability. No parabens, soy, phthalates, sulfates, gluten, or nuts. Keratin protein and provitamins B and E improve manageability and help prevent breakage. Sulfate, soy, phthalate-free. Fairy Tales Hair Care - Free of parabens, sulfates, harsh chemicals and toxins. Jojoba, avocado and murumuru butters keep curls soft and frizz free. Great for swimmers and beach goers of all ages. Remove sea salt, chlorine green and daily build-up with gentle fruit extracts. Keratin and vitamin b extracts strengthen, smooth and detangle all hair types, and is great for the whole family. Sulfate, soy, phthalate-free. No parabens, gluten, soy, sulfates, phthalates, or nuts. Keratin protein and provitamins B and E improve manageability and help prevent breakage. Rich conditioner instantly replenishes moisture to dry, britle sun damaged hair. Quinoa protein and Rice Amino Acids. Can be used on wet or dry hair. Fairy Tales Hair Care Curly-q Hydrating Shampoo - Sulfate, soy, phthalate-free. Enriched with vitamins and minerals, our formula helps to cleanse, condition, detangle and prevent head lice. Fairy tales curly-q shampoo lightweight formula is designed to hydrate thirsty locks, help detangle unruly knots and define curls and tame frizz. Formulated without dairy, soy, gluten or nuts. Loaded with natural extracts and rich, creamy moisturizers to deep clean and condition even the most sun damaged hair. Transforms hair to soft, silky perfection. Fairy Tales Hair Care FT-841002+841003 - Mururmuru butter moisturizes for lasting hydration, frizz control and defining curls. Gluten, sulfates, soy, dairy and nut free. Fairy tales curly-q hydrating conditioner provides necessary moisture to curls to keep them shiny and looking fabulous but is lightweight enough not to weigh them down. . Gluten, paraben, dairy and nut-free. Create great shine and seal out humidity. Formulated without dairy, soy, gluten or nuts. It is clinically proven effective to help prevent lice, and is gentle enough for everyday care for children and adults alike. Sulfate, soy, phthalate-free. Lightly mist the hair then gently brush through. Helps comb thru with ease to eliminate struggle with comb and brush. Fairy Tales Rosemary Repel Daily Kid Shampoo 12 oz & Conditioner 8 oz Duo for Lice Prevention - Natural quinoa and rice amino acids helps define curls and improve manageability. Gently cleanses while Aloe nourishes and hydrates curly and wavy hair. This super lightweight spray gel works to control frizz while shaping and holding curls all day long. Free of parabens, harsh chemicals and toxins. Gently cleanses while Aloe nourishes and hydrates curly and wavy hair. Leave-in 3-5 minutes for extra conditioning. Kid city cool, LLC 571 - No parabens, gluten, phthalates, soy, sulfates, or nuts. Keratin protein and provitamins B and E improve manageability and help prevent breakage. Free of parabens, sulfates, harsh chemicals and toxins. Gluten, sulfates, soy, dairy and nut free. Fairy tales curly-q hydrating conditioner provides necessary moisture to curls to keep them shiny and looking fabulous but is lightweight enough not to weigh them down.
. Natural quinoa and rice amino acids helps define curls and improve manageability. A quick rinse reveals seriously soft hair- without any buildup. Enriched with vitamins and minerals, condition, our formula helps to cleanse, detangle and prevent head lice. This super slip formula nourishes, seals, and smooths frizzy strands. SoCozy Detangling Rinse In-Tub Super Tangle Eraser, 10.5 Fluid Ounce - Keratin and vitamin b extracts strengthen, smooth and detangle all hair types, and is great for the whole family. Gluten, dairy and nut free. Proprietary blend of organic Rosemary, Lavender, Peppermint, Citronella, Tea Tree and Geranium oils helps prevent lice. Jojoba, aloe and Chamomile hydrate, moisturize and soothe the scalp. Formulated without dairy, soy, gluten or nuts. It is clinically proven effective to help prevent lice, and is gentle enough for everyday care for children and adults alike. SoCozy Curl Shampoo Sweet-Crème, No Frizz or Fuss, Curls Done Right, 10.5 fl. oz. SoCozy Splash Swim Leave-in Treatment Plus Detangler, 8 oz.